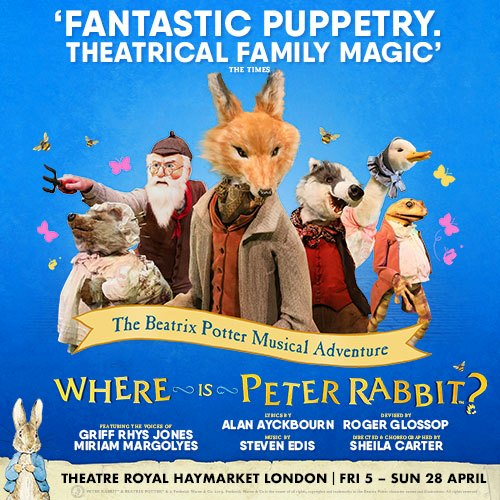 See the last minute tickets available for Where is Peter Rabbit? Prick up your ears to the delectable voiceovers from BAFTA Award-Winning national treasure Miriam Margoyles (Harry Potter Film Series and Call the Midwife) and one of the UK’s most respected TV and stage personalities, the Olivier Award-Winning Griff Rhys Jones. Shake your tail to 14 of the most joyful songs all performed live, with lyrics by one of Britain’s most beloved playwrights, Sir Alan Ayckbourn. And twinkle your eyes at the delightful dancing and entrancing set.